I have often been asked how do you grow potatoes? 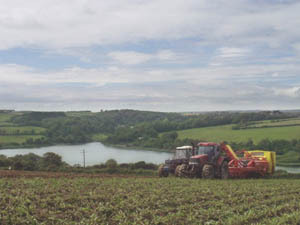 This I hope will give you an idea of planting and harvesting the potatoes in the west country. The ground is then cultivated and put into large beds ready for the destoner. This photo shows the destoner. This machine picks up the soil, takes out the stones and puts the stones to one side of the bank. (These stones are later distributed back into the soil after the crop has been harvested). This photo shows on your left land that has been destoned, the middle row has been bedformed ready for the destoner with the stones placed in the trench on its right. In the top right had corner you can see the rows already planted. The potatoes are planted by this machine. They are placed in the middle of the banks 15cm - 25 cm apart depending on the variety of potatoes. The potatoes grow well in the warm Cornish climate and are ready to harvest the first week in May. When the potatoes are ready to be harvested we lift them with a potato harvester. This gently digs under the bank and lifts the soil complete with the potatoes up onto a large web. The potatoes travel up the web and the soil drops down through the bars. The potatoes then travel over a picking table and here four people pick out all the seed potatoes and stones left behind by the harvester. This is a photo of the picking table on the potato harvester. Here you can see the soil and leaves being picked off by hand. 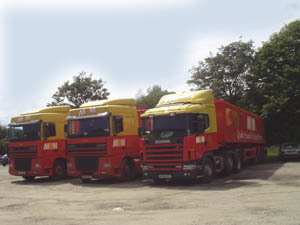 The potatoes are lifted into a trailer, from here they are taken into the packing shed. The potatoes are brought into the packing shed where they go over the grader and into bags ready to be transported to the markets. We grow on Contract for crisp factories and these potatoes go direct to the factories for processing.